Can you stop Lightroom re-sorting keywords alphabetically? Is it possible to stop Lightroom from re-sorting keywords alphabetically? No, but why do you need it? If Alamy, look up Jim Keir’s Alamy plugin. It may solve the problem. The key problem here is how Lightroom writes keywords to exported pictures in alphabetical order, because some stock agencies’ search algorithms are weighted towards the first keywords in the file. 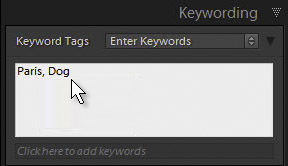 Imagine adding keywords in the Keywording panel’s Keyword Tags box. After entering “Paris, Dog” you would see “Paris, Dog” rather than Lightroom’s alphabetical “Dog, Paris”, and the export file would also list them in the user’s order. As a result, the agency algorithm would display this picture near the top of search results for Paris and lower down if a visitor were searching for dogs. I’ll add that while I understand the problem, I’m not sure I would want Lightroom to be changed to facilitate this workflow. I don’t think sorting is part of the relevant standards, and it’s a pretty blunt search algorithm which is limited to a few agencies. So it’s probably best done by an agency-specific plugin like the one I suggested. An option to enable or disable alphabetical sorting of keywords would make you and me happy on this one. I’m certainly not against it, but I’d be very surprised if Adobe did anything. Realistically, my advice is to look at plug-ins as the best way forward. I’d be interested in hearing more about your exact requirements.